Before Wesley McCune founded Group Research, Inc. in 1962, he worked as a spokesperson for the National Farmer’s Union, an aide in Harry Truman’s Agriculture Department, and a journalist for magazines like Newsweek, Time and Life. Out of a combination of professional and personal interest, he made a habit during these years of clipping articles related to conservative politics from newspapers and magazines. With Group Research, he made it a nearly thirty-five year long career. GRI’s aim was to document and publicize the activities and propaganda of conservative activists and organizations operating in the United States. To this end, McCune and his employees continued his earlier practice of collecting items about (mostly) right-wing “extremist” groups from periodicals. 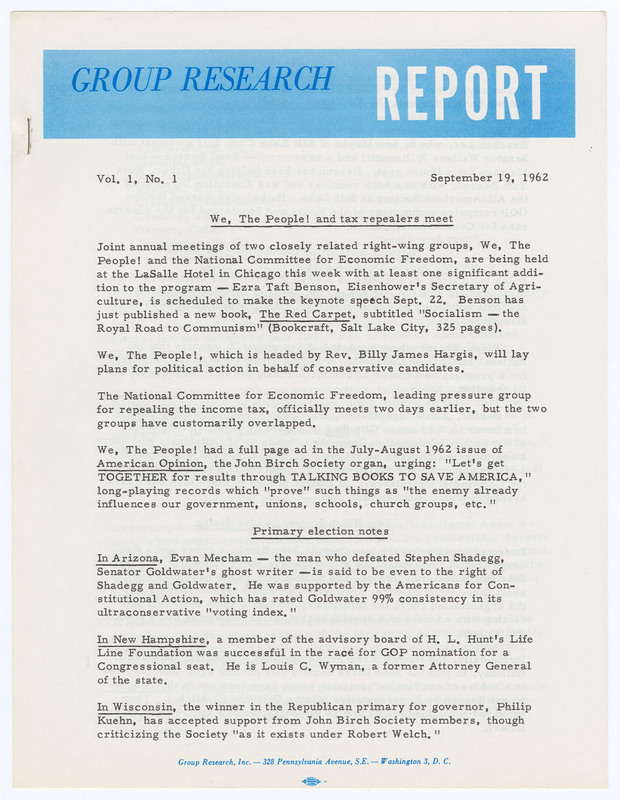 But they also greatly expanded McCune's original focus on journalistic coverage to include publications, recordings, artifacts, and all manner of ephemera that conservative activists and organizations produced themselves. Spanning the early-1960s to the mid-1990s, these items collectively provided an overview of nearly every cause, organization, individual, issue, or campaign that was important (and many that weren’t) for the development of conservative activism and politics in the United States during the second half of the twentieth century. Advancing in age, McCune stopped collecting materials and closed Group Research, Inc. in 1996. The Rare Book & Manuscript Library of Columbia University acquired GRI’s archives the same year. The items appearing in this exhibit are drawn exclusively from the collection born of that material: The Group Research, Inc. Records.